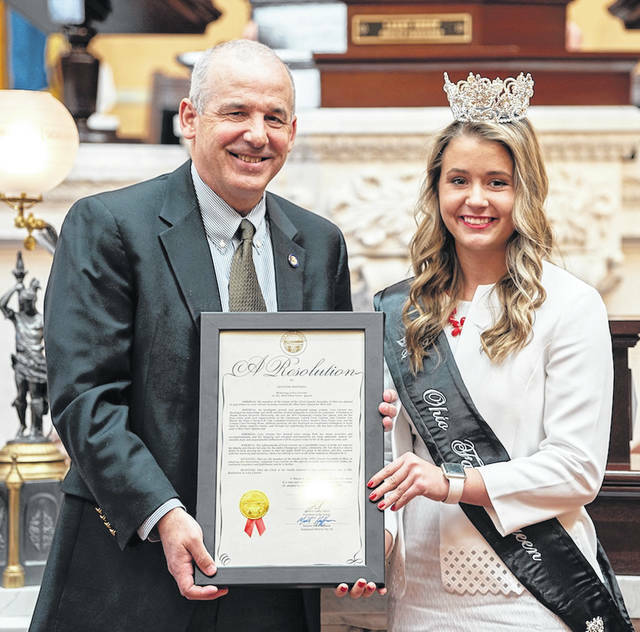 COLUMBUS – State Sen. Matt Huffman (R-Lima) this week honored Lora Current of Champaign County for being named the 2019 Ohio Fairs’ Queen. “As we prepare for Ohio’s fair season, it’s fitting that we take a moment to recognize Lora, who will travel across Ohio in the coming months representing our state’s rich agricultural heritage at our many county fairs,” said Huffman. Champaign County’s 2018 Fair Queen, Current was selected as Ohio Fairs’ Queen by the Ohio Fair Managers Association from a field of 77 county and independent fair queens. This year she will visit county and independent fairs in all 88 counties to help showcase Ohio’s agricultural community and economy. Active in 4-H, she graduated from Troy Christian High School and is studying social work and theology at Mount Vernon Nazarene. She wants to become a hospital chaplain. For a full schedule of Ohio’s county fairs, visit the Ohio Fair Managers Association website at www.OhioFairs.org.